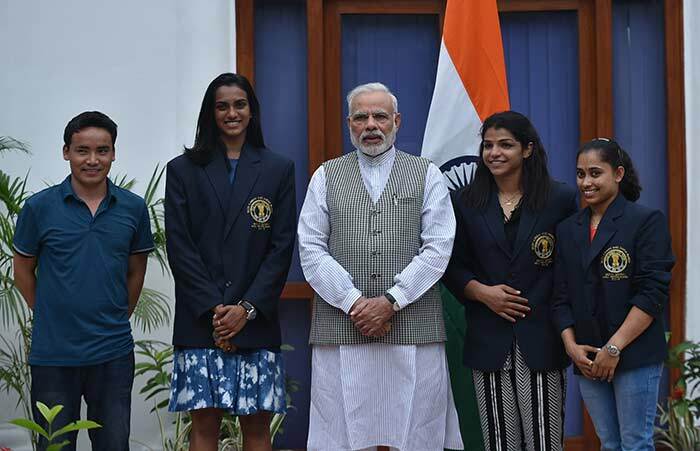 (L-R): Jitu Rai, Dipa Karmakar, Prime Minister Narendra Modi, PV Sindhu and Sakshi Malik at 7, Race Course Road. 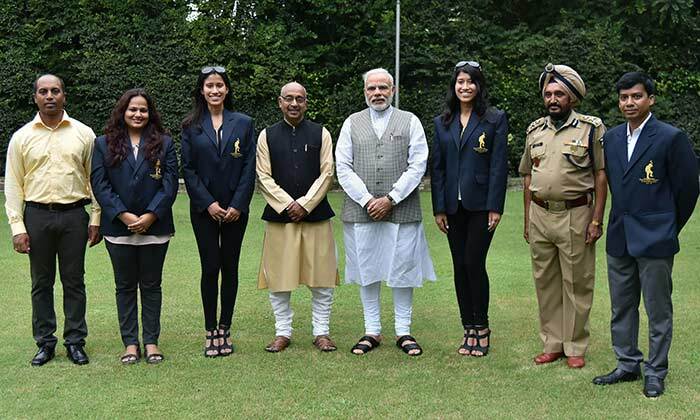 Prime Minister Narendra Modi and sports minister Vijay Goel pose for a photograph with the Arjuna awardees. 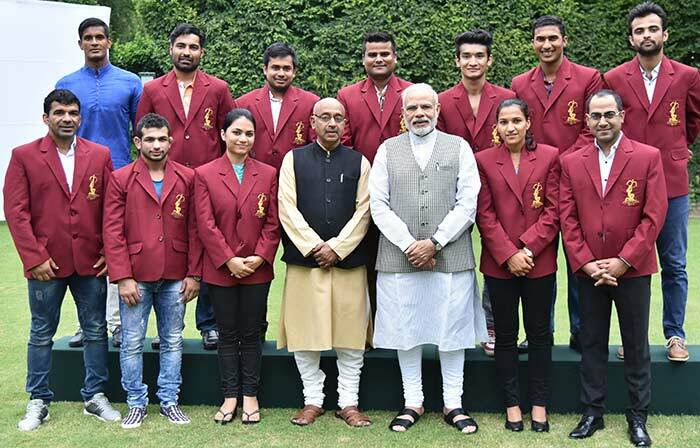 Prime Minister Narendra Modi with the Dhyan Chand and Maulana Abul Kalam Azad Trophy Winners. 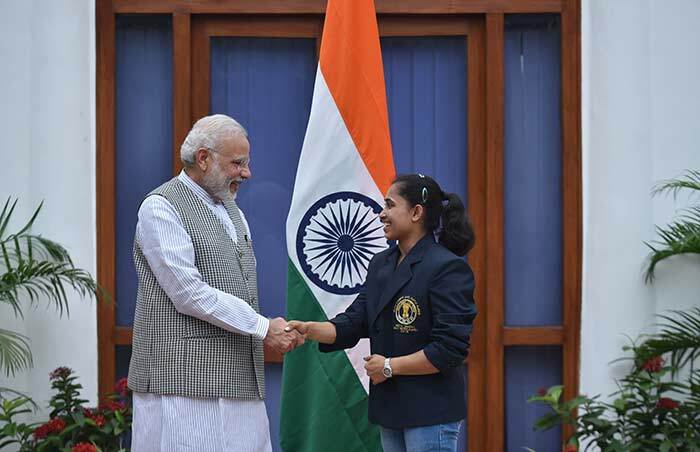 Prime Minister Narendra Modi congratulates gymnast Dipa Karmakar, who will be conferred with the Rajiv Gandhi Khel Ratna Award. 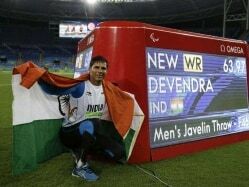 Prime Minister Narendra Modi greets Khel Ratna awardee-shooter Jitu Rai. 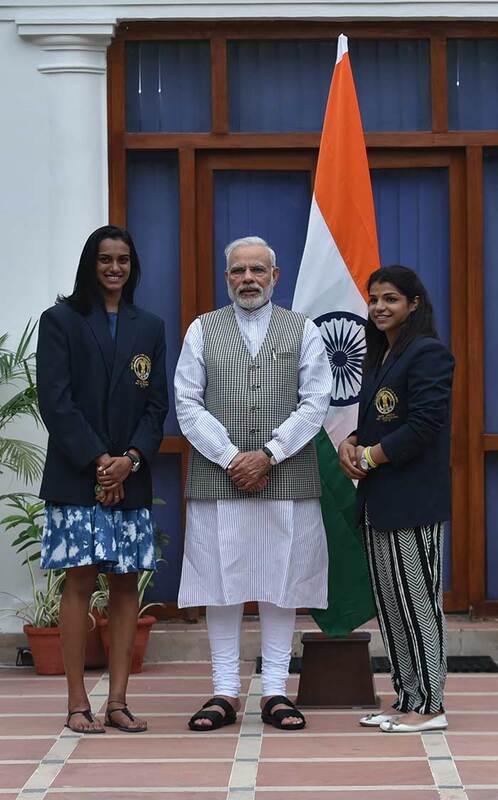 PM Modi poses for a photograph with badminton star PV Sindhu (left) and Sakshi Malik (right). 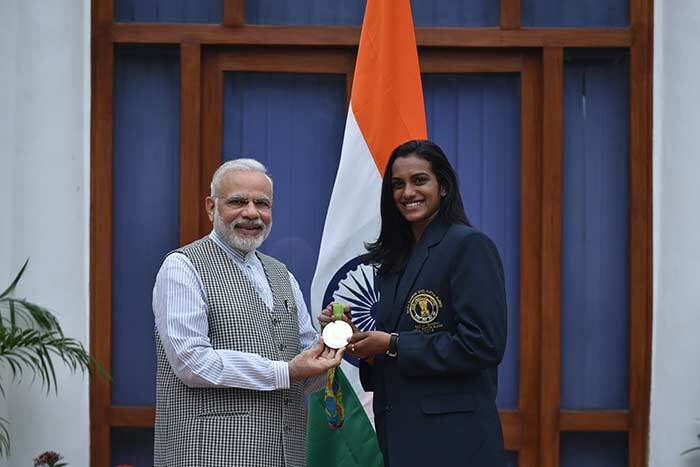 Badminton star PV Sindhu won silver in the women's singles event at the just-concluded Rio Olympics. Sakshi Malik clinched a historic bronze medal in the women's 58 kg freestyle wrestling event at the Rio Olympics. 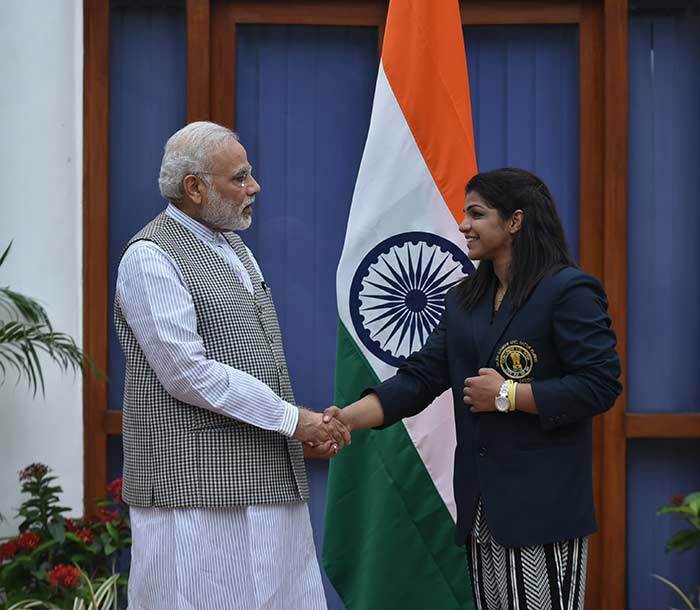 Prime Minister Narendra Modi with the Rashtriya Khel Protsahan Puruskar awardees. 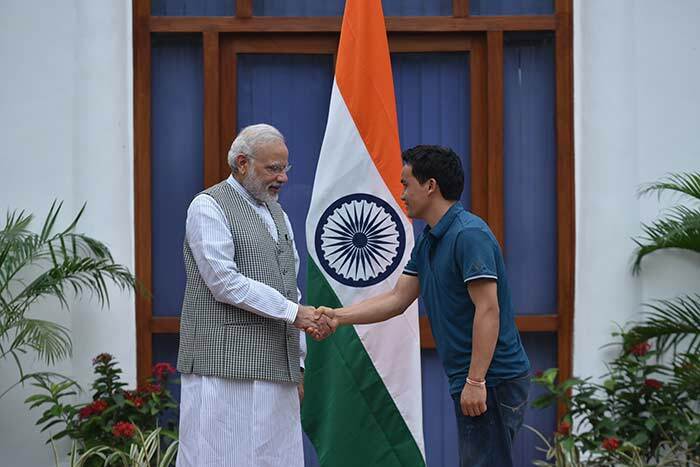 Prime Minister Narendra Modi with the Tenzing Norgay National Adventure Award winners at his residence. 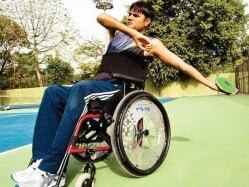 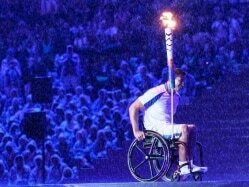 All the four athletes were recommended for the Khel Ratna after their phenomenal performance at Rio Olympics.